Van graffiti that puts van owners well and truly in the driving seat. 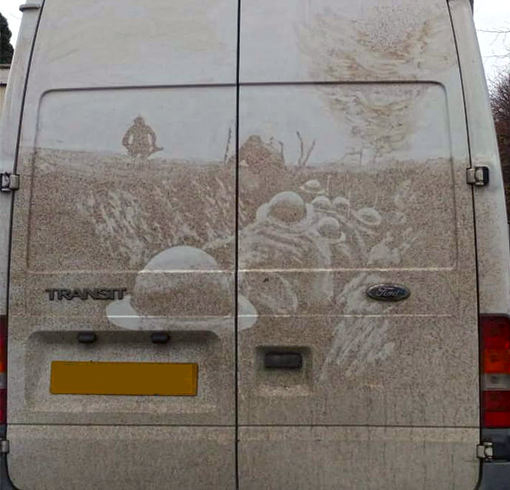 When it comes to dirt-splattered vans, you can forget the old ‘clean me’ scrawls of years gone by – petty reminders to get a bucket of water and some soap out to spruce up your work vehicle. Modern day social commentaries have evolved – and in doing so, turned the dirty white van from a thing of shame into a masterpiece. Whether it’s witty repartees, puns, or stunning visual portraits on offer, white vans are now something we seek out, rather than seek to avoid, during those long daily commutes. Plenty of puns are doing the rounds, even from respectable companies. Morrisons vans now come with slogans like ‘No courgettes left in this vehicle overnight’; Tesco home delivery vans sport punnets of strawberries that have been ‘freshly clicked’; while a personal favourite has to be from haulage company Andy Freight, whose HGVs have a giant baby’s face on the back panel with the words ‘Just about the only thing not delivered by Andy Freight’. The professional phenomenon has largely been prompted by smaller, localised efforts at making van graffiti more engaging and interesting. From funny comments about personal relationships to amended business names, mucky vans usually offer more than you might expect when you’re queueing behind them. Meanwhile, those with vision have interpreted dirt-covered van panels in another way – as a canvas for their artwork. From depictions of famous faces to important historical and social events, a handful of van graffiti artists are rewriting the rules when it comes to making a white van look good. Two famous examples are James Gibson, whose rendering of celebrities as well as stunning depictions of WWI trenches have captured the public’s imagination; and Rick Minns, a.k.a. Ruddy Muddy, who focuses more on landscapes to great effect. But the hobby is taking off globally as well, as Azerbaijani parking attendant Rafael Veyisov proves. Instead of simply parking your car as part of the service, you sometimes get your vehicle returned to you with incredible cityscapes depicted on the side. Locals are so impressed they’ll deliberately leave their cars dirty before taking them to be parked, so he can make the most of the opportunity. And this is what we have today… an absolutely stunning and thought provoking image created by James Gibson.